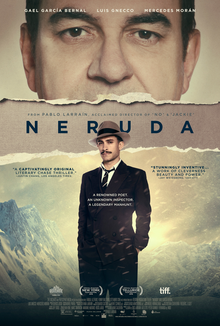 Neruda is a 2016 internationally co-produced drama film directed by Pablo Larraín. It was screened in the Directors’ Fortnight section at the 2016 Cannes Film Festival.It was selected as the Chilean entry for the Best Foreign Language Film at the 89th Academy Awards. The film was released in Chile on 11 August 2016 and is scheduled to be released in the United States on 16 December 2016, to be followed by release in France on 4 January 2017. The film talks of an inspector (Gael Garcia Bernal) who hunts down Nobel Prize-winning Chilean poet, Pablo Neruda (Luis Gnecco), who becomes a fugitive in his home country in the late 1940s for joining the Communist Party. Mumbai Film Festival 2016: Day 1 Recco!